We just broke up after being in a two and a half year relationship. We had stopped communicating to each other about our thoughts and feelings. As problems arose, I began to shut myself off to him and he insistently kept asking me questions about what was wrong but he never really let me think about things to answer him truthfully about what was going on. As I began to shut him out I also began to lose weight from the stress of the problems that we were having. Finally, after much thought on both our parts we broke up, and he said that he just wanted some time apart. I on the other hand realized that to regain my health and personality, I needed to distance myself entirely from him. One night in anger I told him that we could never date again because he had hurt me so much and I needed to regain my self and my soul. After a few weeks of talking others and being apart from him, I found my personality and started the healing process of regaining weight and becoming myself. About a week after we broke up he started going out with another girl and I found out it was because he was really hurt about my comment saying I didn’t think we could ever date again. We are trying to become friends and we both still love each other and want to get back together but we still have some apprehensions about it because he still has a girlfriend and I’m not sure if it would work and I don’t want to be hurt twice because the first time it broke my heart and his. Do you think that we should get back together? Also, do you think that we should just see how things go and if we are meant to be together then somehow we will both realize that and things will work out in the end? The communication pattern your relationship ended from is unfortunately all too common. Think about it. Half of marriages end in divorce. Many for just that reason. And far far more once-promising relationships end in suffering way before people get to the marriage stage. Whatever underlying issues you were once trying to work out got stuffed by the communication blockage. Ultimately, as you say, that led to deep emotional stress. And in the end, you had to break it off. The important difference between couples that split up and those who stay together, is NOT that couples who stay together have less issues to iron out. All couples have issues to deal with. The difference is that couples who stay together have learned better communication skills to handle their issues. Couples who learn communication skills that help them resourcefully overcome their problems will stay together and have lasting love. Couples who just keep reacting either sink into permanent unhappiness or eventually split up. Most people have not learned good communication tools. It’s that simple. Where would we learn them? In school? From our model parents? I don’t know about you, but I did not find much in the way of truly happy, longterm, loving relationships around me from which I could model good communication skills. Instead of constructive strategies to resolve issues, most of us have modeled the patterns that lead us to shut down, get defensive, get judgmental, not listen, avoid, argue, go numb, retreat into confusion, become critical, and so forth. Since all couples have problems from time to time, it pays to learn new skills and strategies for how to better resolve issues. So your question about what to do now? Maybe wait and just see how things work out? Hmmmm… Why would they work out? What would have changed to make them work out? 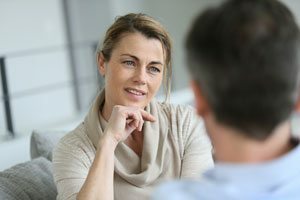 Did one or both of you learn some new strategies for communicating effectively and dealing with emotionally charged issues? Now, that would make a difference. I would not recommend you get back together unless you knew that both he and you were going to learn new strategies for how to communicate and resolve challenging issues. If you do not adopt new strategies, then why would the next time around turn out any different than the last time around? Unless you have a new strategy in place, you will end up repeating the same old patterns and ultimately find yourself in the same old pain. If you do find yourself talking to him about getting back together at some point, then I suggest the first thing you talk about is learning new strategies. Have a very open, honest and caring conversation about the need to develop better patterns of communication. Get his agreement on this point, get a real commitment — before you are even willing to get back together. ← Can you rebuild intimacy after a breakup?